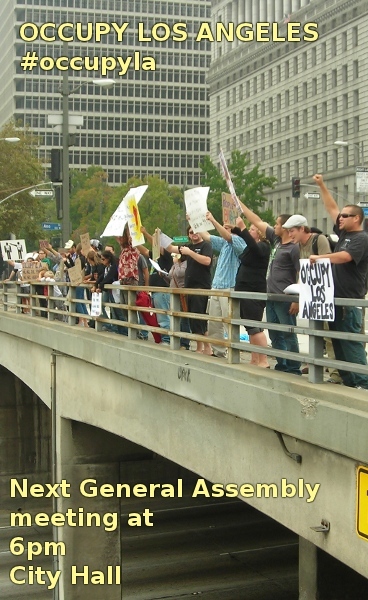 Report from the #occupyLA meeting and march. There's another meeting tonight at City Hall's south steps at 6pm. Go if you want to support the NYC occupation, and join an LA solidarity group. Breaking news: over 60 people have been arrested in NYC today (Sat.) Links below. I became aware of the Occupy LA solidarity group on Facebook on Friday night, and went to the Saturday morning meeting at City Hall, LA. The organization started online, mostly via Twitter and Facebook, and had its first meeting on Friday night. It was a “General Assembly” which is the term for a general meeting of all present. For the most part, the people didn't know each other, or came in pairs. So Occupy LA is not forming from an existing group or coalition. It's a semi-spontaneous group, with no clear platform. The Saturday morning meeting wasn't as large, but after discussion about where and when to set up an occupation, and making group decisions about marching, breaks, and solidarity with a rally by 350.org happening that day, the group started a march. By the time the march started, the group was around 40 people, so new people were showing up. The exact path of the march was indeterminate, save for the initial picket in front of the Congress of Neighborhood Councils which was having some kind of lunch or reception at City Hall. The march went northward to the Hollywood Freeway overpass, were we took a break and got a lot of positive honks from the drivers passing below. By this time, the group had swelled to around 50 people. The activists were tweeting their location, so new people could find the march. Then, the march wound northward past the old church, to the edge of Chinatown, then back south again to the Placita Olvera. From there, they went through Olvera Street, where all the vendors sell Mexican stuff to tourists. That was something I'd never seen before – going right into a touristy area, and through it. Then from there, they went back south to Union Station, for a picket at the train station. They didn't go inside, though that would have been interesting. At this point, it was starting to get a little late for me and I had to break away and go home. The march had swelled to what looked like 70 people. It was hard to tell, because, unlike so many political marches, this one was nearly off-the-radar for LA's progressive community. There weren't many familiar faces. My old cohort from the anti-war marches showed up, but that was because of my facebook invitation. Everyone else was a stranger to me. Some were solo, others were connected into organizations, but overall, it was a gathering of people, not a meeting of "leaders" or a coalition of existing orgs. The organizing was good, but people were being pretty loose, and they didn't have some “activist uniform” on so it's hard to distinguish who is in or our of the protest. Maybe that should be a goal! All in all, a great afternoon. It was awesome seeing so many people who are wiling to get out and protest, and even occupy a public space, on short notice. Maybe this means political situation is “hot”. LA progressives are missing the party. Chants: Abajo con nos bancos, arriba con el pueblo. Banks got bailed out, we got sold out. You are the 99%. Walk with us. Please share this article widely. Copy it to your own accounts on the content buckets, social networks, and any other venues.